One thing I love about browsing for movies, especially from online streaming sites, is the ability it gives me to find films I know absolutely nothing about. I’m used to watching movies that I already know many details from because of trailers or various online sources. 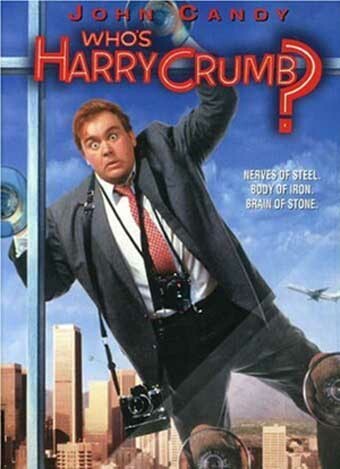 Who’s Harry Crumb? is a movie I found in a streaming service’s collection that I’ve never heard of. It stars John Candy, who is apparently a bumbling detective. It sounds madcap and slapstick, so this should be pretty fun. An heiress is kidnapped, and her father goes to Crumb and Crumb private investigators. The company president Elliot Draisen (Jeffrey Jones) assigns Harry Crumb (John Candy), the last in the line of Crumb detectives, to the case. But what Harry doesn’t know is that Draisen is in fact the kidnapper, and chose him because Harry’s the dumbest detective in the company. Meanwhile, the heiress’s stepmother is scheming to murder the rich father and inherit his money. Candy is predictable Candy in this movie. He plays the same character here as in any other film, but the jokes are not always so strong. As an incompetent detective he has obligatory “bad disguise” sequences, which usually play to a groanworthily obnoxious stereotype. He does have a good dynamic with the kidnapped girl’s plucky teenaged sister, though. I’m thoroughly uninspired by this movie. I can’t say much good or bad about it. The movie just exists. It’s good for a laugh, but even less special than other bland movies I’ve written about. See this movie: to kill 90 minutes. Have fun. Don’t see this movie: without a vomit bucket for the last shot. It’s not pretty.